Since 1954 PROTEGO® has built and provided safety devices and tank equipment, now with the help of more than 500 employees worldwide. Within our area of expertise, we are the technology leader. We provide global services for our customers, which include research and development, application-specific engineering, and overall protection system design. Our customers know they can trust in our products and high quality and development standards for process engineering, the petroleum, chemical, and pharmaceutical industries and the bio-energy sector. 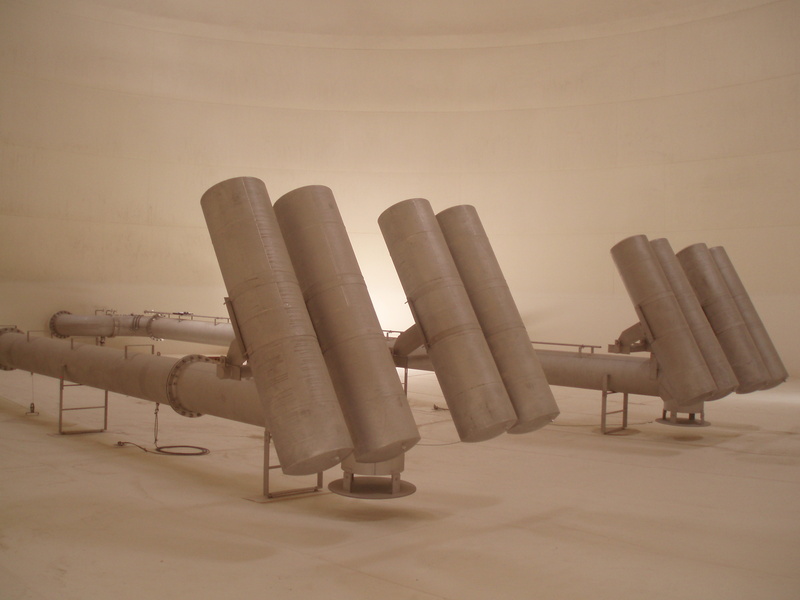 Floating Suction Units PROTEGO® SA/S are designed to ensure that product in a storage tank is drawn off just below the surface of the liquid where it is cleanest. 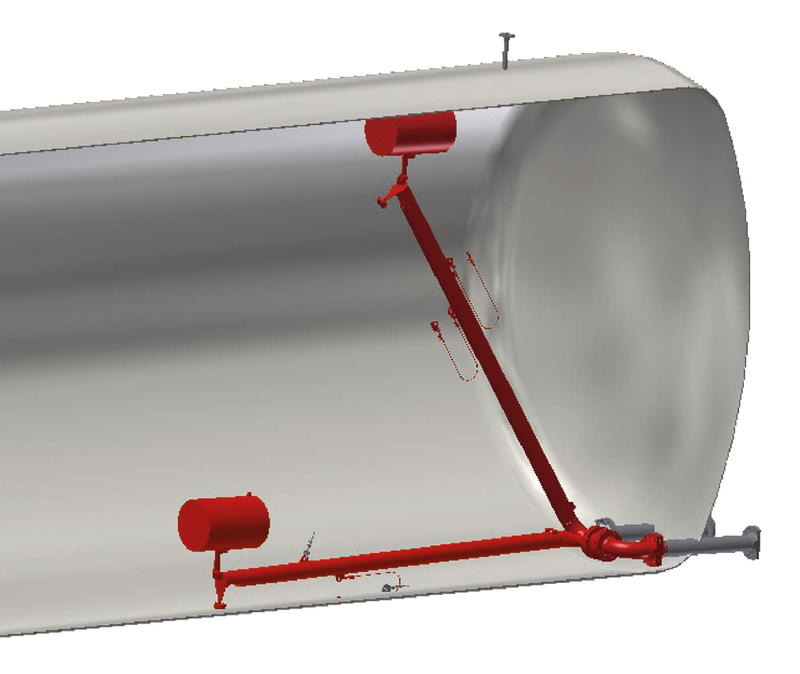 Together with the tank operator or the contractor we are developing customized solutions for a maintenance-free operation of the fuel storage tank. Our intention is to satisfy the customer with the supply of a reliable system which provides the required reliability operators are looking for. The use of heavy duty swivel joints which are able to bear all loads from the operation is essential for the entire design of the system. Function indicator and sampling pipes are features which are available as options to meet customers requirements. 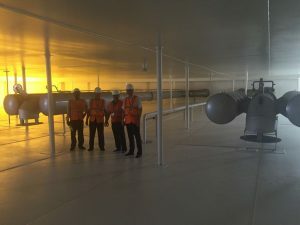 Floating Suction Units PROTEGO® SA/S are designed to ensure that product in a storage tank is drawn off just below the surface of the liquid where it is cleanest, preventing the suction point being at the bottom of the tank where water and residuals will settle down. PROTEGO® Floating Suction Units are designed and sized to suit the individual tank specifications and customer requirements. PROTEGO® Floating Suction Units are designed for a long life in service. For Jet Fuel we use stainless steel. Solutions are available in sizes from 1” to 48” for horizontal or vertical tanks with fixed or floating roofs. Custom design for unusual stored products are available. PROTEGO® Floating Suction Units offer experienced technology for a complete solution for the end-user. This includes easy installation and assembly and full documentation with general arrangement drawing showing the Floating Suction Unit placed in the tank. Essential for the design of the PROTEGO® Floating Suction Unit is the Heavy Duty Swivel Joint which needs to fulfill the requirements for an in-service installation. The design of the swivel joint is essential for the life-time of the entire system to avoid high costs of repairs and to extend the tank maintenance to the planned interval. a sturdy design made of stainless steel. Other materials are available upon request. large size ball bearings with two races to cover all forces during operation. PROTEGO® Floating Suction Units have an intake designed to avoid any forming of vortex. The intake is able to release trapped air. Floats are all made of stainless steel and are 100 % pressure tested to ensure their tightness. 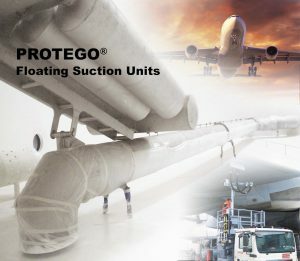 PROTEGO® Floating Suction Units are “Made in Germany” and will provide many years of trouble free tank operation. Universal FSU is designed to be used in horizontal tanks. The main application is all kinds of Aviation Fuel. Universal FSU provides a reliable and cost-efficient solution for horizontal tanks Made in Germany. Connection to the discharge pipe of the tank from the dished end and from the top are possible. Standardized design to match all typical tank sizes. Universal FSU`s design facilitates the installation. The VD/SV type PROTEGO® valve is a highly developed pressure and vacuum relief valve with excellent flow performance. Typically the valve is installed in the in- and outbreathing lines of tanks, vessels and process apparatus to protect against unallowable high and low pressure. The valve prevents emission losses almost up to the set pressure and prevents air intake almost up to set vacuum. The device will start to open as soon as the set pressure is reached and only requires 10% overpressure to full lift. Continuous investments into research and development have allowed PROTEGO® to develop a low pressure valve which has the same opening characteristic as a high pressure safety relief valve. This “full lift type” technology allows the valve to be set just 10% below the maximum allowable working pressure or vacuum (MAWP or MAWV) of the tank and still safely vent the required mass flow. The opening characteristic is the same for presssure and vacuum relief. Due to our highly developed manufacturing technology the tank pressure is maintained up to set pressure with a tightness that is far superior to the conventional standard. This feature is achieved by valve seats made of high quality stainless steel and with precisely lapped valve pallets or with an air cushion seal in conjunction with high quality FEP diaphragm. The valve pallets are also available with a PTFE seal to prevent the valve pallets from sticking when sticky products are used and to enable the use of corrosive fluids. 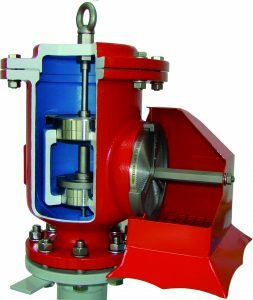 After the excess pressure is discharged or the vacuum is compensated, the valve reseats and provides a tight seal. 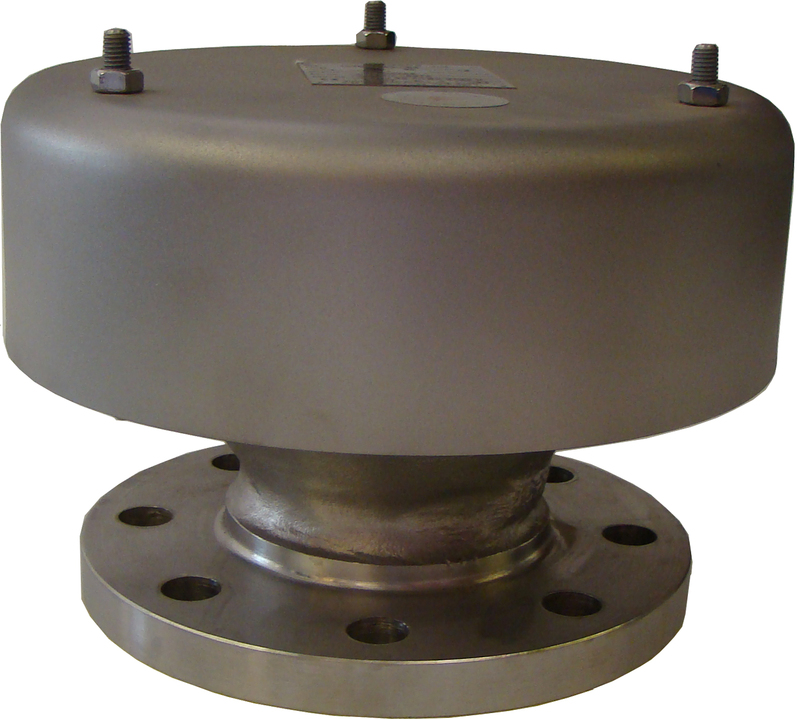 The atmospheric deflagration-proof VD/TS type PROTEGO® valve is a highly developed combined pressure/vacuum relief valve for high flow capacities with an integrated flame arrester unit. It is primarily used as a safety device for flame transmission proof in- and outbreathing on tanks, containers and process engineering apparatus. 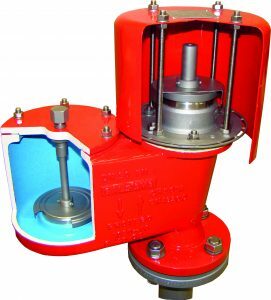 The valve offers reliable protection against excess pressure and vacuum, prevents the inbreathing of air and product losses almost up to the set pressure and also protects against atmospheric deflagration. The PROTEGO® flame arrester unit is designed to achieve minimum pressure drop with maximum safety. The PROTEGO® VD/TS device is available for substances from explosion groups IIA to IIB3 (NEC group D to C MESG ≥ 0.65 mm). When the set pressure is reached, the valve starts to open and reaches full lift within 10% overpressure. This unique 10% technology enables a set pressure that is only 10% below the maximum allowable working pressure (MAWP) or maximum allowable working vacuum (MAWV) of the tank. After years of development, this typical opening characteristic of a safety relief valve is now also available for the low pressure range. The tank pressure is maintained up to the set pressure with a tightness that is far superior to the conventional standard due to our state of the art manufacturing technology. This feature is ensured by the valve seats made of high quality stainless steel and with individually lapped valve pallets or with an air cushion seal in conjunction with high quality FEP diaphragm. The valve pallets are also available with a PTFE seal to prevent the valve pallets from sticking when sticky products are used and to enable the use of corrosive fluids. After the excess pressure is discharged, the valve reseats and provides a tight seal. If the set pressure is exceeded, explosive gas/product-vapour air mixtures are released to the atmosphere. If this mixture ignites, the integrated PROTEGO® flame arrester unit prevents flame transmission into the tank. The PROTEGO® LH/AD end-of-line deflagration flame arrester provides protection against flame transmission through atmospheric deflagration. The device is typically installed on vent lines of vessels and process engineering apparatus which are not pressurized. For safe application it is important that an endurance burning situation can be excluded, so typically it is installed on vent lines which discharge vapour for a short time period only. The device prevents flame transmission from atmospheric deflagration into the vessel or plant. The PROTEGO® LH/AD consists of a housing, a weather hood and the PROTEGO® flame arrester unit. The device is equipped with a metal weather hood. A protection screen is installed between the weather hood and the housing to keep animals out. The FLAMEFILTER® gap size will depend on the devices intended use. Detailing the operating conditions such as the temperature, explosion group and the composition of the fluid, enables PROTEGO® to select the best end-of-line deflagration flame arrester for your application. The PROTEGO® LH/AD series end-of-line deflagration flame arrester is available for substances from explosion groups IIA to IIC (NEC groups D to B). The standard design can be used with operating temperature of up to +60°C / 140°F. Devices with special approval can be obtained for higher temperatures upon request. For more information go to: https://www.protego.com/products/detail/LH_AD.html.